Geography relates to the study of the dynamic and ever changing world in which we live. As a highly employable subject, Geography allows students to develop an understanding of the Human and Physical processes which underpin the subject, whilst developing a range of key transferrable skills. Geographers at South Shore Academy follow an exciting and varied curriculum, designed to give them an appreciation and understanding of the wider world in which we live. By studying Geography, we aim to prepare all of our students to become responsible global citizens. Year 8 (1hr per week): Brazil, Extreme Environments (Antarctica, Rainforests, and Deserts), Floods and Tourism. 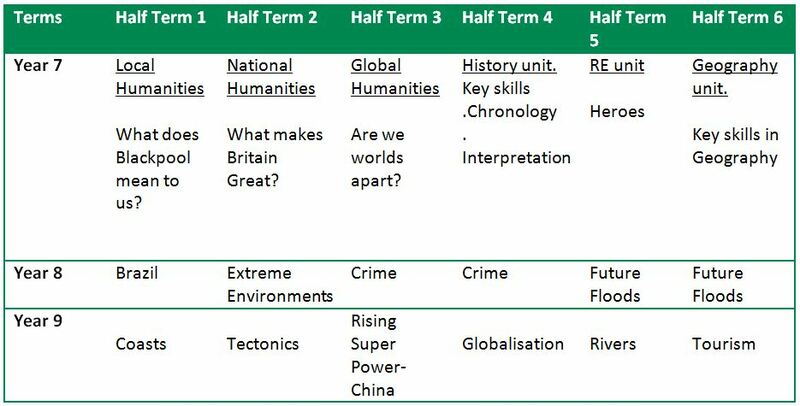 Year 9 (2hrs per week): Coasts, Globalisation, China, Risky World (Plate Tectonics), The Geography of Crime and Conflict, Rivers and Climate Change. At KS4 our students follow the WJEC Specification A Geography course. This syllabus covers a range of both Physical and Human topics which are applied to real life case studies to give students a balanced and wide-ranging understanding of the issues facing our modern world. All students get the chance to experience a variety of fieldwork opportunities and develop skills that are highly sought after by future employers. This paper consists of 6 Themes, 3 Physical and 3 Human. They include; Water, Climate Change, Living in an Active Zone (Volcanoes and Earthquakes), Changing Populations, Globalisation and Development. Students study 3 Themes from this paper; Our Changing Coastline, Tourism, and Retail and Urban Change. The controlled assessment element to this course provides students with problem solving skills and the ability to think analytically about issues affecting our world. Students’ complete two pieces of controlled assessment; A Decision Making Exercise (DME) which is worth 15% of their total GCSE and a fieldwork enquiry which is worth 10% of their total GCSE grade.